595 pages | 93 B/W Illus. 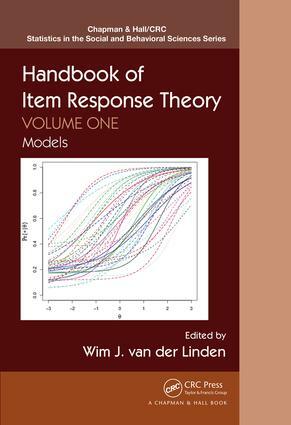 Drawing on the work of internationally acclaimed experts in the field, Handbook of Item Response Theory, Volume One: Models presents all major item response models. This first volume in a three-volume set covers many model developments that have occurred in item response theory (IRT) during the last 20 years. It describes models for different response formats or response processes, the need of deeper parameterization due to a multilevel or hierarchical structure of the response data, and other extensions and insights. In Volume One, all chapters have a common format with each chapter focusing on one family of models or modeling approach. An introductory section in every chapter includes some history of the model and a motivation of its relevance. Subsequent sections present the model more formally, treat the estimation of its parameters, show how to evaluate its fit to empirical data, illustrate the use of the model through an empirical example, and discuss further applications and remaining research issues. "Handbook I is likely to be useful for undergraduate or graduate students who have an interest in pursuing quantitative research in educational and psychological testing, especially with datasets that contain multiple discrete outcomes. Master- and doctoral-level students seeking dissertation topics and doing literature reviews will find Handbook I a valuable resource."